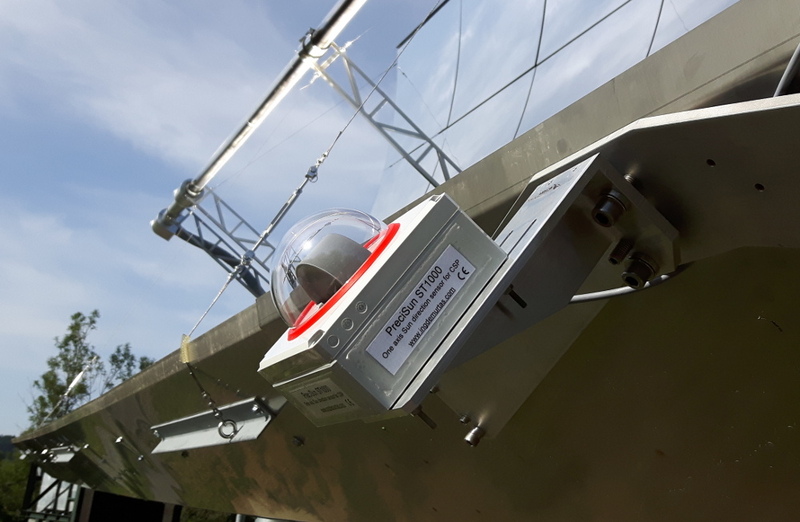 Sun tracking control system for EuroTrough parabolic concentrator, PreciSun ST1000. This control system is fully automatic, easy to install and easy to use, and can increase the efficiency of your CSP plant by improving the tracking accuracy. It comprise of a control unit, a one axis Sun direction sensors, an inclinometer, and a control unit for each EuroTrough tracker. 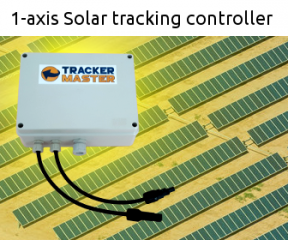 The PreciSun control system ensures that the tracker is always oriented at best towards the Sun, to maximize the energy production. The control unit can directly control the movement of the tracker, being this hydraulic or electric, and can be easily integrated in the control system of the CSP plant trough standard communication interfaces. With respect to astronomic solar tracking systems, this tracking system has the advantage of a reduced complexity and higher efficiency. Due to settlement of the foundations and deformation of the structure, astronomic tracking systems require periodic calibration, which is not needed with PreciSun ST1000 because the tracking error is measured directly. The system was developed by ingdemurtas with the support of the Danish Innovation Fund, and it was tested in the MicroSol facility of Promes-CNRS in Odeillo, France. 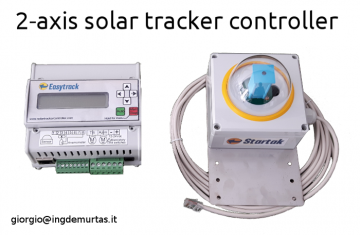 For more information write to giorgio (at) ingdemurtas.it and visit our dedicated website www.solartrackercontroller.com.